Go the extra smile with our app! READY TO SMILE? LET'S DO THIS! join the club and be all smiles! *Reward in-app only upon registration or first login. 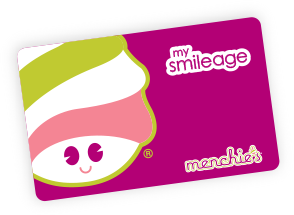 $5 in Menchie’s Money reward may take up to 12 hours to appear in your account. Valid at participating locations only. 2 smiles per $1 spent will end 60 days from first login.